Get a handle on your business! The Sam4s SPS 2000 is designed for reliability. Flexibility with built in POS software. The SPS 2000 won`t require operating system upgrades, doesn`t need network administration support and your information will not be compromised. 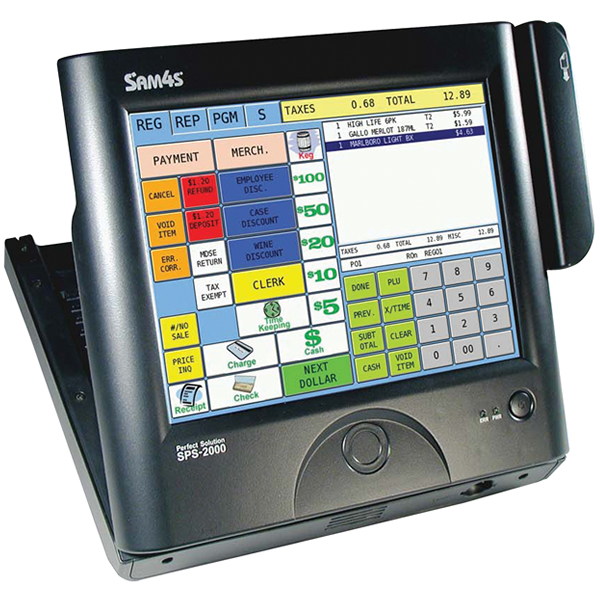 The SPS 2000 can be set up and installed at a lower cost and in less time that a PC based POS system. 12.1" TFT-LCD color touch screen, single line custom display, and time clock portion. High Speed built in thermal printer can be added (#9702). Up to 20,000 price look ups. Mix and match discounts. 5 reporting buckets. ECR`s are more secure than PC based POS system. Magnetic Card Reader included. Accurate pricing via bar code scanning (#9709 or #9710. Cash Drawer can be added (#9703).